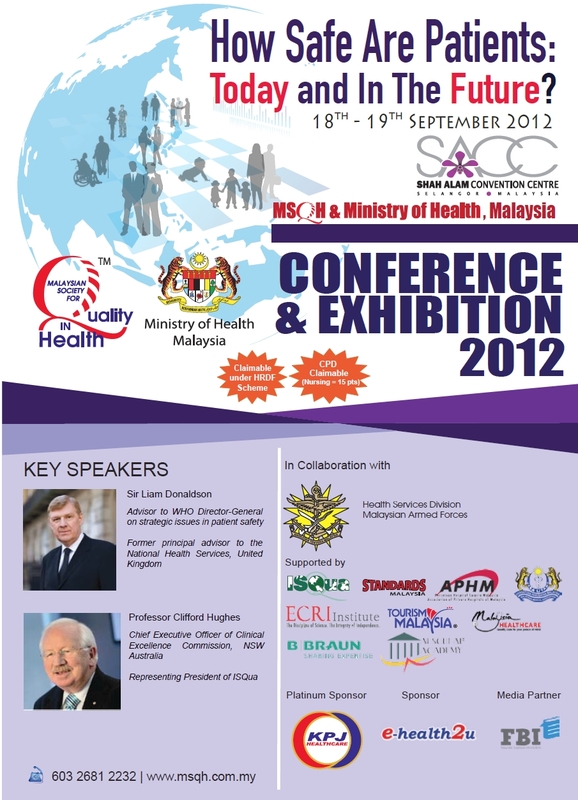 Malaysian Society for Quality in Health (MSQH) and Ministry of Health (MOH) in collaboration with the Malaysian Armed Forces (Health Service Division) will be organising a 2012 Conference & Exhibition on 18th and 19th September 2012 at Shah Alam Convention Centre with the themes " How Safe Are Patients : Today and In The Future ?" 4. Measuring Service Performance and Key Performance Indicator (KPI) / Outcomes. CEO, COO, Medical Directors/ General Managers, Quality Directors/Managers, Consultants/Specialists, HOD, Medical Officers, Nursing Directors, Service Managers, Supervisors, Nurses, Assistant Medical Officers, Allied Health Staff, General Practitioners,General public interested in health care quality and safety issues and Student in Medical, Nursing and Allied Sciences.